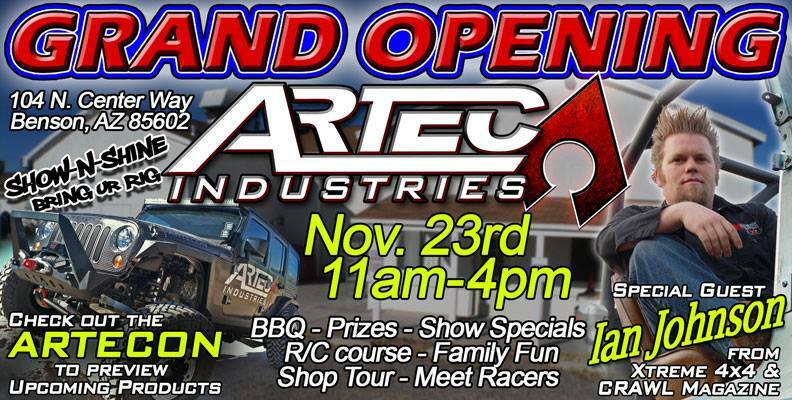 This Saturday, November 23rd, Artec is inviting everyone to a Grand Opening event. Ian Johnson, host of Xtreme 4×4, will be making a special appearance, along with Artec sponsored Racers and the Artecon JK Jeep featuring products that will be available through Artec. Bring your rig and enter it into the show-n-shine, bring your RC Car and put it to test on the Artec course, enjoy the Free BBQ and enter to win in the Raffle with prize packages worth over $3000. Raffle tickets are $5 each with all proceeds benefitting Toys for Tots Foundation. This is a family friendly event. Join the Facebook Event page at https://www.facebook.com/events/560429827360048. “We were bursting at the seams at our other location, with the addition of this new facility it will allow us to do better things!” said Artie. The new location has a retail showroom that is conveniently located directly off the I-10. With the new machinery, and dedicated production area, the team will optimize production and work flow enabling higher product line capacity, creating greater inventory and shipping efficiency which will support their customers with faster order turnaround times. Artec Industries introduced a line of Jeep JK products at the SEMA show on the Artecon. These products will be in streamline production soon. Put your order inline atwww.ArtecIndustries.com.